This 18 hole scenic masterpiece is artfully interwoven with the character and contours of Sun City Mesquite's spectacular landforms. Undulating through canyons with gently ascending and decending elevations, rugged rock outcroppings and tranquil water elements, the integrity of the land is preserved at every opportunity. The masterful design and creativity of famed golf course designer, Gary Panks, provides this championship course the appearance of being crafted by nature forged over time. Whether you are a novice, an avid player or prefer the role of spectator, everyone will enjoy the dramatic beauty the course showcases as it meanders through the heart of the community. Tranquil, yet infused with great drama, grand view corridors delight residents and visitors alike. 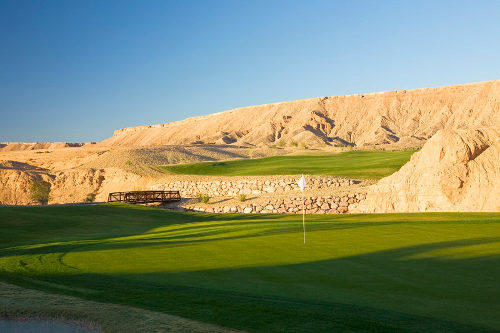 Just one hour north of Las Vegas, Nevada and located within the Del Webb active adult community of Sun City Mesquite, Conestoga Golf Club is professionally managed by Troon Golf.